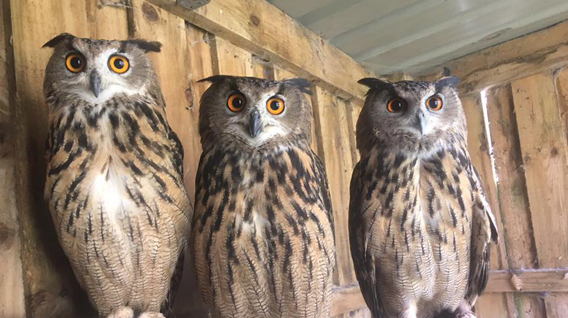 There are various breeds of Eagle Owl, the ones you can see here are European Eagle Owls which are the largest type. 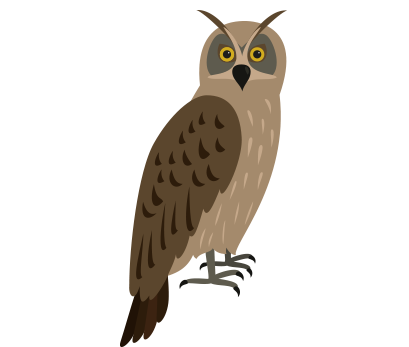 European Eagle Owls will hunt and catch prey the size of a hare of baby deer. An Owls eyes are fixed and so it cannot move its eyes from side to side, if it wants to look at something it has to move its whole head. Owls cannot turn their heads the whole way around! They can move it 180 degrees one way and then 180 degrees the other way. The shape of an owls eyes is tubular not spherical like ours. This give the owl excellent telescopic vision, needed for hunting. 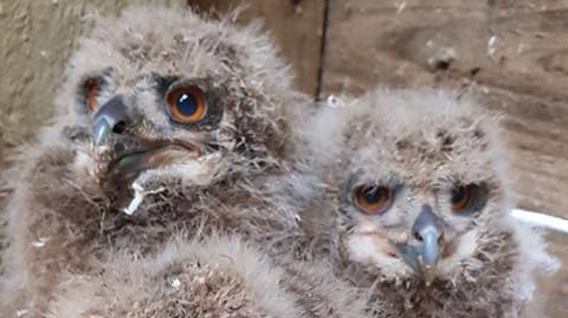 A male is known as a MALE, a female is known as a FEMALE and a baby is known as a OWLET. A group is known as a PARLIAMENT. The largest and most ferocious owl in the world. They have a deep two tone hoot. 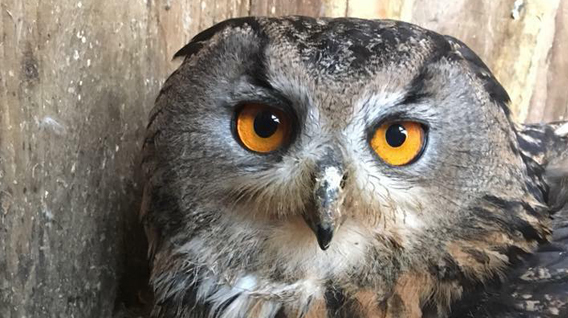 A wild eagle owl was once seen carrying a Red fox in it’s talons! The great size, bulky, barrel-shaped build, ear tufts and orange eyes make this a distinctive species. The ear tufts of males are more upright than those of females. The plumage coloration, across 13 accepted subspecies, however can be somewhat variable. The upperparts may be brown-black to tawny-buff to pale creamy gray, typically showing as dense freckling on the forehead and crown, stripes on the nape, sides and back of the neck, and dark splotches on the pale ground colour of the back, mantle and scapulars. The rump and upper tail-coverts are delicately patterned with dark vermiculations and fine wavy barring. The facial disc is tawny-buff, speckled with black-brown, so densely on the outer edge of the disc as to form a “frame” around the face. LONGEVITY: In captivity can live over 60 years. WEIGHT: They weigh around 6 - 10 pounds. SIZE: Height up to 2 feet and wingspan up to 6 feet. DIET: They are a carnivore. Eat rats, rabbits, birds and even lambs. GESTATION: Breeding season is from December to April, laying between 1 – 4 eggs. Incubation is around 35 days.